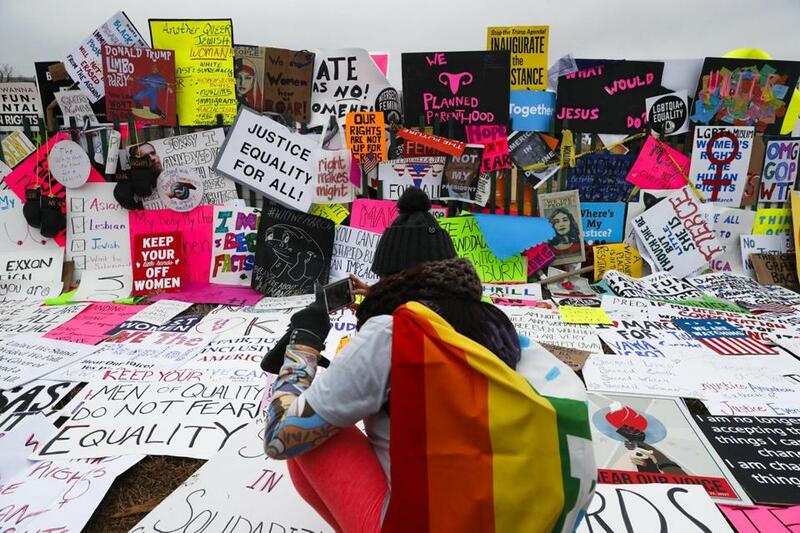 Protesters left signs outside the White House for the Women&apos;s March on Washington during the first full day of Donald Trump&apos;s presidency in Washington. After a brutal first week in Trump’s America, the question that emerged from last weekend’s Women’s March seems even more urgent: How to turn the energy of protest into meaningful opposition? It is an especially vexing question in blue states like Massachusetts, where there are no Republican congressmen to oust and your state senator seems like a decent guy. But there is meaningful work to be done from Boston, Harwich, and Sheffield. Below, a brief guide to taking action — and keeping your sanity in the midst of it all. Get organized. Last month, a group of former congressional aides released “Indivisible: A Practical Guide for Resisting the Trump Agenda.” It quickly went viral. Drawing on the lessons of the Tea Party, the 26-page document walks readers through a step-by-step process for turning their members of Congress from critics of the president to dogged opponents. Among the offerings: a detailed dissection of how members of Congress think, tips on how to use representatives’ “town hall” events to maximum effect, and techniques for coordinating constituent calls to their offices. Download it at indivisibleguide.com. Find a swing district. Your member of Congress may be right on the issues, or simply unbeatable come election time. But you can still have an impact — a direct, in-person impact — on the midterm congressional elections that will be so central to the fate of the Trump agenda. Go to swingleft.org, type in your city, town, or zip code, and find the closest swing district. There are more in New England, and in upstate New York, than you might imagine. 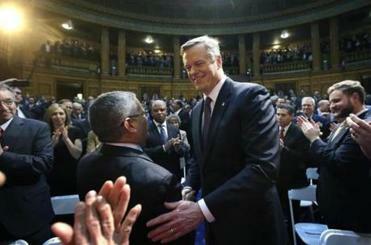 Governor Charlie Baker, looking for common ground, is being true to Charlie Baker — and to Massachusetts. Advocate for a popular-vote presidency. The Electoral College system gives undue weight to the rural, conservative states that helped push Trump into power — and could re-elect him in four years. If you think it’s time for a change, support the National Popular Vote Interstate Compact. It’s a clever alliance of states that have agreed to commit their electors to whoever wins the popular vote, rendering the Electoral College meaningless. The agreement will only go into effect when and if states accounting for the 270 electoral votes required for victory pass the legislation. So far, 10 states — including Massachusetts, Rhode Island, and Vermont — and Washington D.C. are on board, representing 165 electoral votes. Just 105 to go. Readers in states like Maine and New Hampshire can press their elected officials to join. Subscribe to a newspaper. Sure, this is a little self-serving. But newspapers create the kind of informed citizenry vital to a healthy democracy. And when investigative reporters find evidence of corruption and abuse of power, they can put a president on his heels. Act local — and strategic. Trump’s election has driven a surge of interest in local politics. If Washington is a dead-end, pushing for change close to home looks more attractive. Find an open seat, or an out-of-touch incumbent, and run for office. Or take up a cause: One of the most important things suburbanites can do, for instance, is advocate for more affordable housing in their hometowns. Landmark research from Harvard University a couple of years ago shows a subsidized apartment in a well-off community provides the best ladder of opportunity for the poor. Finally, take a walk. This is an ugly moment in our national life. Sometimes, it’s hard to watch. But this is still a beautiful country. Get out and see it. Recharge. The Blue Hills are nice this time of year.